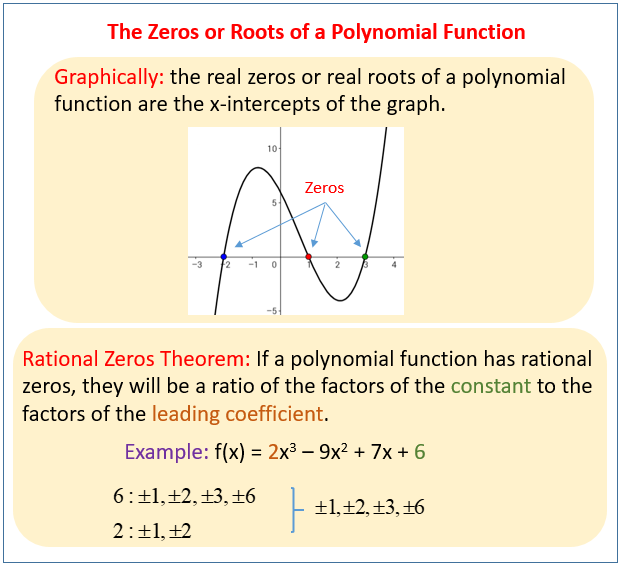 Videos and lessons to help High School students identify zeros of polynomials when suitable factorizations are available, and use the zeros to construct a rough graph of the function defined by the polynomial. Find the zeros of a polynomial when the polynomial is factored. Use the zeros of a function to sketch a graph of the function. The following figure show how to find the zeros or roots of a polynomial function. Scroll down the page for more examples and solutions. This video explains the connection between zero, factors, and graphs of polynomial functions. and c is a real number such that P(c) = 0. 1. The real number c is a zero or root of P(x). 2. x = c is a solution to the equation p(x) = 0. 3. (x - c) is a factor of P(x). 4. The point (c, 0) is an x-intercept of the graph of P(x). 1. A degree 4 polynomial has zeros or roots of multiplicity 1 at x = 0 and x = 3 and a zero of multiplicity of 2 at x = -1 and has a leading coefficient of -2.
a. Give the x-intercepts of the polynomial function. b. Write the polynomial function in factored form. c. Graph the polynomial function. 2. Given the graph of a degree 3 polynomial. b. Find the real zeros or roots of the function. c. Find the equation of the polynomial function. Sketch the graphs of the following polynomials. What is 'End Behavior'? How do I describe the end behavior of a polynomial function? Find the end behavior of the following polynomial function. How the degree and multiplicity affect the graph of a polynomial. Find all zeros of a polynomial function. This video covers many examples using factoring, graphing, and synthetic division.